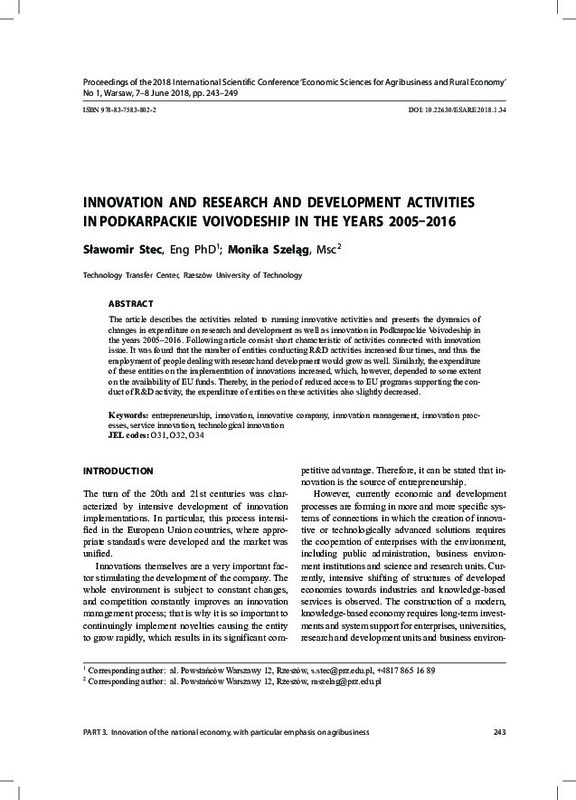 The article describes the activities related to running innovative activities and presents the dynamics of changes in expenditure on research and development as well as innovation in Podkarpackie Voivodeship in the years 2005–2016. Following article consist short characteristic of activities connected with innovation issue. It was found that the number of entities conducting R&D activities increased four times, and thus the employment of people dealing with research and development would grow as well. Similarly, the expenditure of these entities on the implementation of innovations increased, which, however, depended to some extent on the availability of EU funds. Thereby, in the period of reduced access to EU programs supporting the conduct of R&D activity, the expenditure of entities on these activities also slightly decreased.